Coming home is always a really amazing experience. The magic of seeing the mountain, taking a dip in the ocean, and breathing in the fresh air of Cape Town is so refreshing, but as locals, after about two weeks in the city, the excitement and idea of being home, and seeing friends and family wears off. Don’t get me wrong, we love Cape Town, but as long-term travellers, we are always looking for something new and different from what we know. With a few major events planned for our current trip to Cape Town, we committed to spending six months in the city. 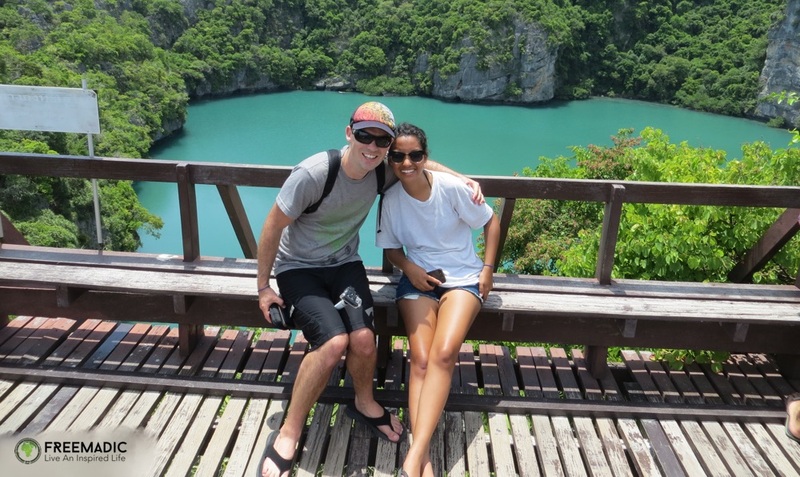 And over the last four month, as locals, we’d become almost immune to the city’s beauty and vibe, and started taking for granted what we had access to – world class beaches, amazing hikes, and delicious food. This made me sad, and I knew that I needed to fall back in love with my hometown. 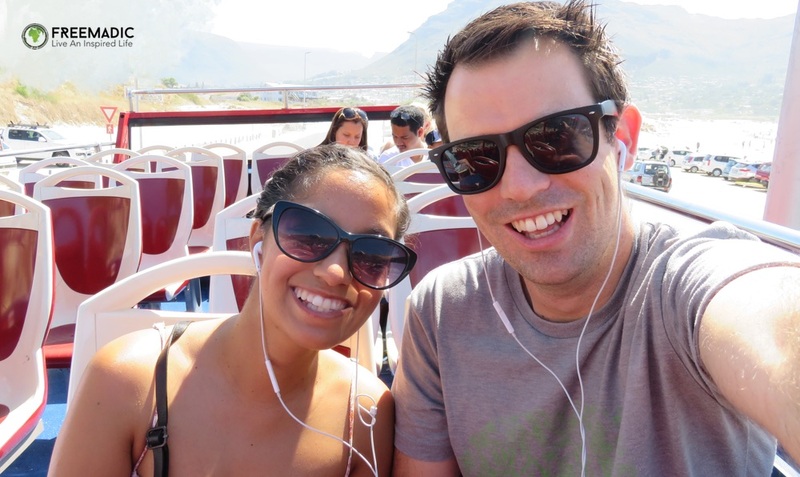 We recently celebrated a few personal milestones, and decided to do something that both of us hadn’t done before in Cape Town – taking a trip on the CitySightseeing Bus. As Capetonians we love being tourists in our own city, and this was the perfect excuse to do so. 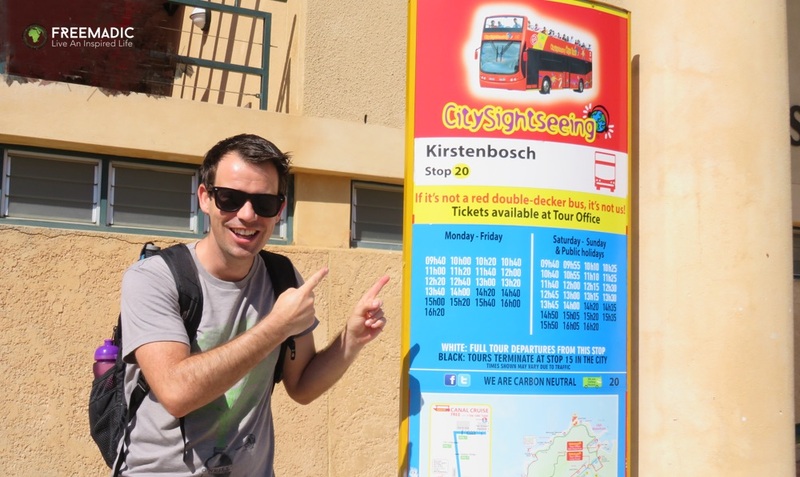 Like every other tourist that visits Cape Town in summer, we got up super early and headed to Kirstenbosch Botanical Gardens where we boarded the CitySightseeing Bus, and joined their Blue Route tour. Tip: Coming for the Southern Suburbs of Cape Town, we decided to avoid the chaos of the V&A Waterfront and rather board the bus on route. 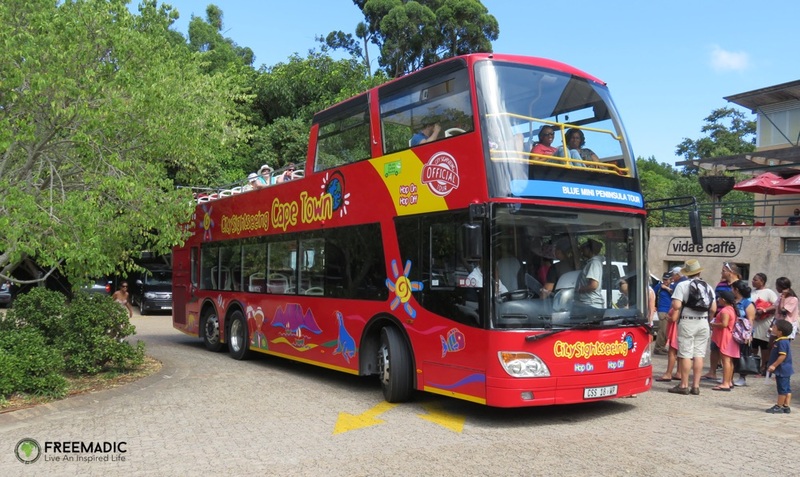 Not only does Kirstenbosch have free, secure parking, but you can purchase your tickets online or directly on the bus. Boarding the bus was quick and easy, and we settled on the upper deck which has the better views. 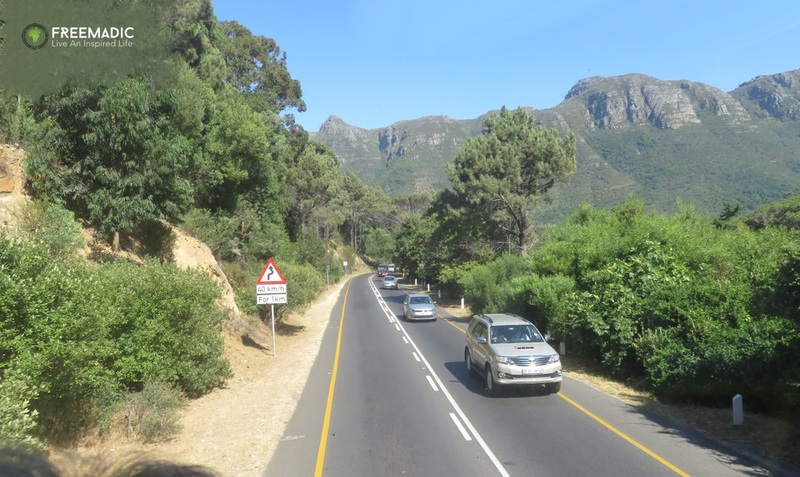 As we headed through the suburbs of leafy Constantia and Hout Bay, on a road that is almost carved into the forest, I could slowly feel myself being reintroduced to the magic of Cape Town – it must have been something about the fresh air, and almost being able to touch the treetops. 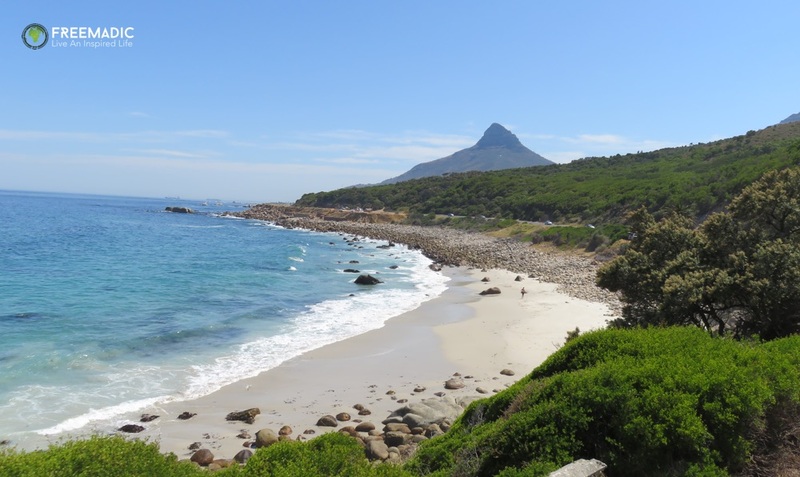 As we passed the township of Hout Bay and headed towards the beach, the commentary became more and more interesting and I started to learn new things about my city. 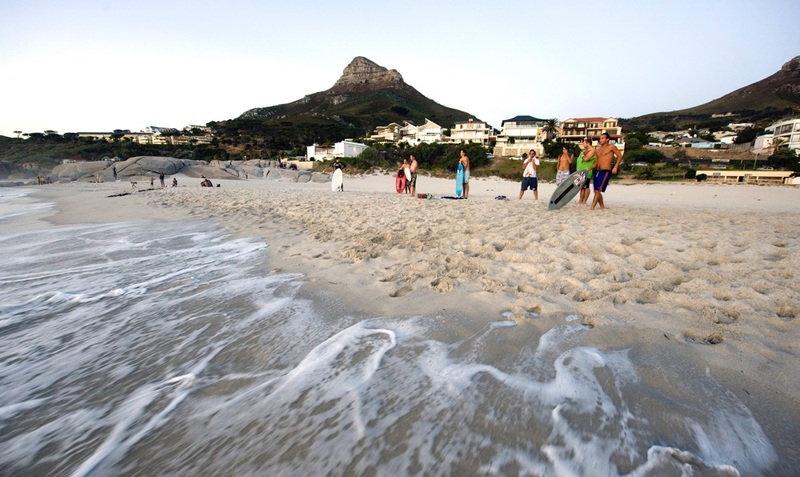 Heading over towards the Atlantic Seaboard, we were immediately hit by a cool sea breeze. As locals, we found the commentary a little redundant and extremely boring, so we pulled out our headphones and just enjoyed the views. With not a cloud in the sky and surprisingly no wind, The Mother City was making a conscious effort to impress us. How can anyone not fall in love with this city after seeing the mountains tower out of the ocean complemented by the pristine white sandy beaches? I surely felt like I was the luckiest girl in the world to call this city my home. 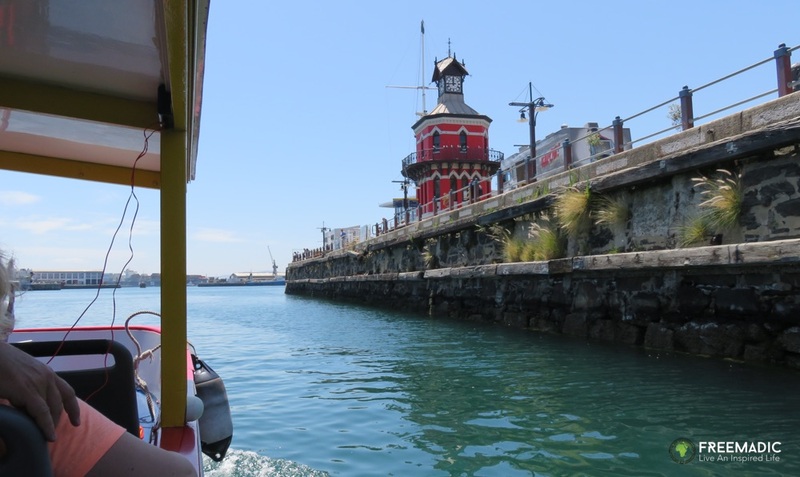 We then headed along Beach Road towards the Green Point Lighthouse (sadly no mention of the fog horn which is located close by) and Cape Town Stadium, before heading to the V&A Waterfront. This was our first stop where we decided to hop on the CitySightseeing Harbour Cruise. With our two day pass, this cruise was free and an absolute pleasure. 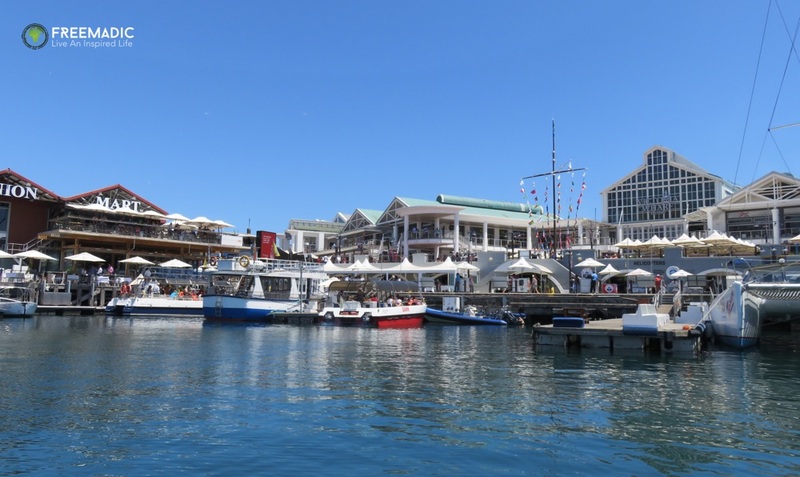 Taking us around the small harbour where we continued to learn about Cape Town, the V&A Waterfront and harbour itself. 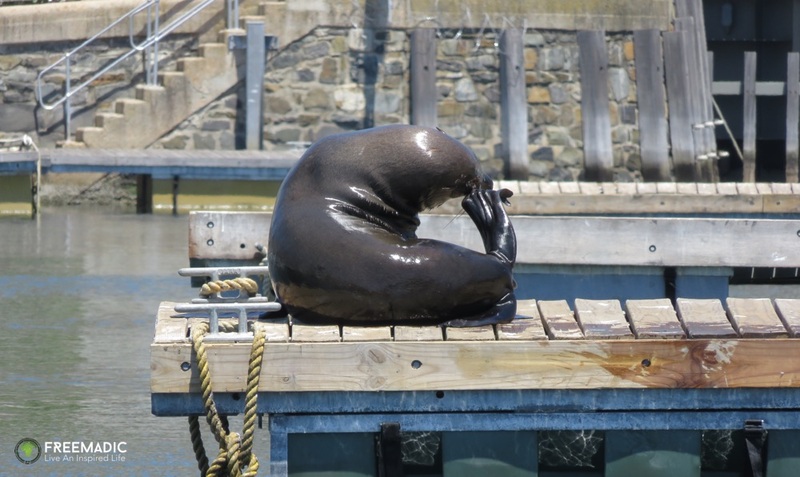 My favourite part was seeing the adorable seals floating on the water’s surface who were warming themselves by holding their flippers in the air. 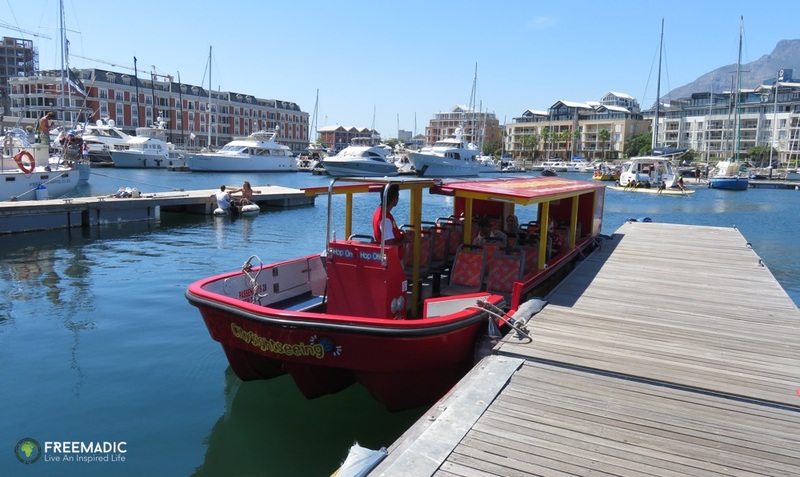 After lunch, we decided to take a loop on the Red Route tour which took us through the city, up to the Table Mountain Cableway and back along the Atlantic Seaboard to the V&A Waterfront. The one thing that all Capetonians know and do, is to avoid any and every tourist attraction during peak season in Cape Town. We do this to avoid the traffic and long queues, but being on the bus, I was forced to head up to the cableway. For me, not driving, it was an opportunity to take in the views from Table Mountain of the city below, and absolutely have my mind blown by Cape Town’s beauty. 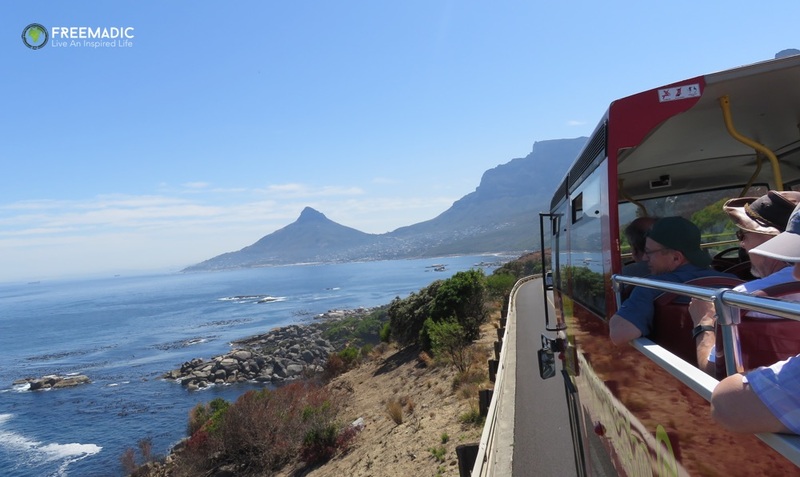 Tip: If you don’t have a ticket to the Table Mountain Cableway, they are available on this bus. We strongly advise that you pre-purchase your ticket online or on the bus to avoid the crazy queues. Exhausted and ready to head home, we changed buses again to get back on to the Blue Route, and headed back to Kirstenbosch Gardens. 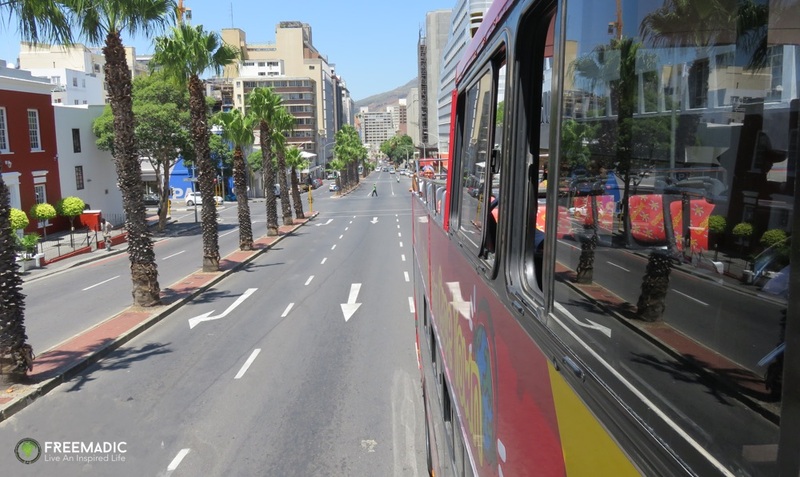 Looking back on my day on the CitySightseeing Bus, I fell back in love with my hometown. Having travelled so much over the last two years has made me come home, and not really appreciate what I have, where I’ve grown up, and the people that make this place so special. But being a tourist in my own city, and taking the time to explore made me love my hometown even more. One of the most breathtaking moments during our entire seven month stay in Southeast Asia was experiencing the Mae Jo Sky Lantern Release. Once a year both tourists and locals head to the small town of Mae Jo about 30 minute scooter drive outside of Chiang Mai, to attend the graduation ceremony of an independent Buddhist group called the Duangtawan Santiparp Foundation. Arriving early around 3pm, we quickly found a shady spot on the grass amongst the thousand of people that had already arrived. With delicious food on sale, we spent the afternoon chatting, eating, and learning about different Buddhist practices and traditions. As night falls the ceremony begins with the graduates and their families presenting themselves as other monks give them their blessings. The night ends with an orchestrated mass sky lantern release that is absolutely beautiful and something that we will never forget. Carrying people’s wishes and hopes, the sky lit up with thousands of lanterns in a spectacular eyeful. This unforgettable moment is definitely something to add to your Thailand bucket list. 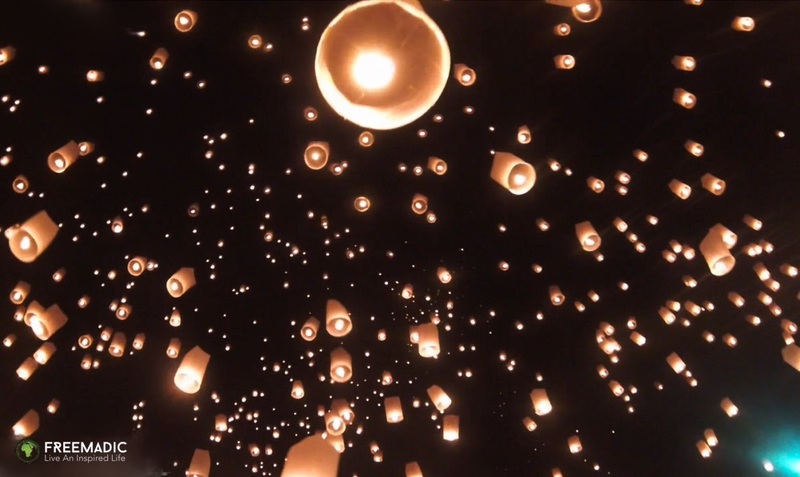 Commonly confused as being part of the annual Yi Peng Festival (also known as Loi Krathong Festival), this mass sky lantern release is an independent event not organised by Tourism Authority of Thailand (TAT) or the Chiang Mai Municipal Authority. Even though entrance is free, guests need to dress respectfully and may not bring their own lanterns, but instead purchase them from the stalls at the event for 100 Baht each. 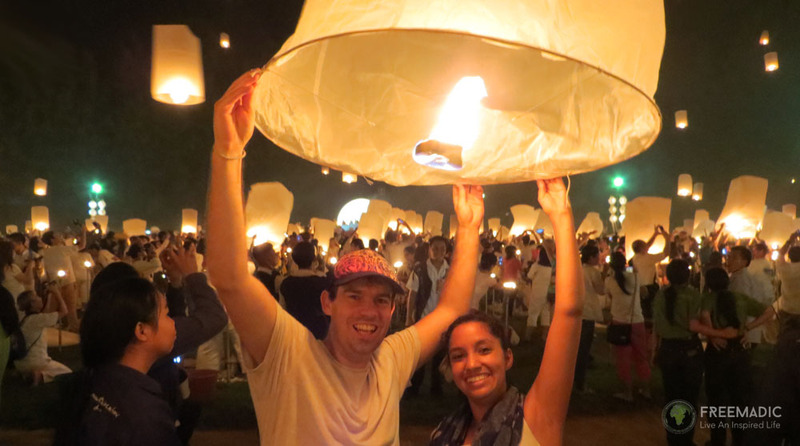 If you have any questions about visiting Chiang Mai or the Mae Jo Sky Lantern Release, please ask us on Twitter (@FreemadicLife) or on Facebook. Wherever you are in Thailand, whether it’s Phuket, Koh Samui, Bangkok or Chiang Mai, you will find scooters everywhere. 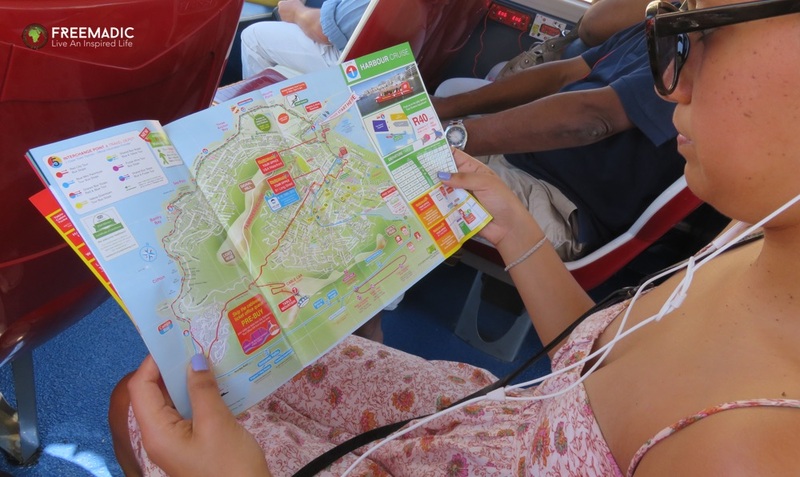 It is the mode of transport most commonly used by locals, and most tourists and expats will agree that there is no reason not to make use of this affordable and convenient method of transport. During our stays in Koh Samui and Chiang Mai, we too made use of this mode of transport and had a permanent scooter rental. We made a video of a scooter trip we did on Koh Samui. When hiring a scooter, many tourists are not aware of what they are getting themselves into. In this post I’d like to help you understand the risks you take by riding a scooter in Thailand, and why sometimes it is better using a tuk tuk, a songthaew, a taxi or an Uber (in Bangkok only). Over the past two years we’ve heard horror stories where tourists were riding scooters during their stay and got involved in serious accidents. These accidents have not only ended vacations abruptly, but left certain tourists bankrupt and lucky to be alive. 1. Do you have a motorbike license? If you don’t have a motorbike license that let’s you ride legally at home, then you will be riding illegally in Thailand. For most visitors not having a motorbike license won’t cause any problems because scooter rental shops and the police generally don’t check or care. However – this is an important one – if you don’t have a license and get involved in an accident, then your medical travel insurance will most likely not cover you or the person on the back of your scooter. 2. Does your insurance cover motorbike accidents? Most medical travel insurance will cover common accidents including scooter accidents, however as mentioned above, your insurance will not cover you if you are operating a motorcycle without a motorbike license. It’s always recommended to check the fine print to make sure you’re covered. 3. Are you an experienced motorcyclist? Have you driven a scooter before? Do you have experience with lane splitting or lane sharing – this is when you drive in between and overtake slower cars? Have you driven a scooter with someone on the back before? 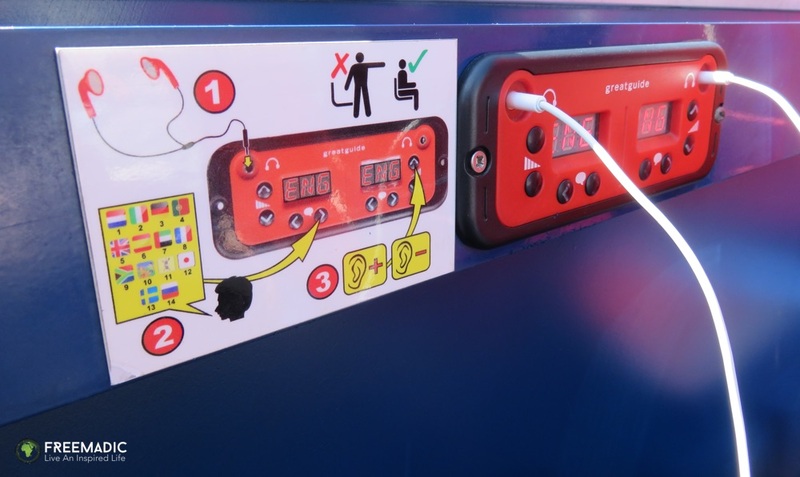 Do you know how fast you can take a corner and how to conduct an emergency stop? Many tourists have never driven a scooter, yet they take the risk of figuring it all out on their travels – sometime with a partner or family member on the back, which I’d strongly discourage. Many tourists take the risks and get away with it, but some end up being the unlucky ones. I recently heard of a couple that got into a serious accident on their scooter and their medical insurance did not cover them. They ended up paying almost US$ 35 000 to cover their expenses of their medical bills and to replace the scooter that had to be written off. If you can’t confidently answer yes to ALL of the above three questions, then I strongly suggest that you rather avoid renting and riding a scooter in Thailand. If you’re willing to throw caution to the wind and take the risks, then good luck and be safe, but don’t say we didn’t warn you. 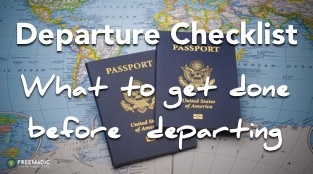 Are you looking for medical travel insurance? We trust and recommend World Nomads. 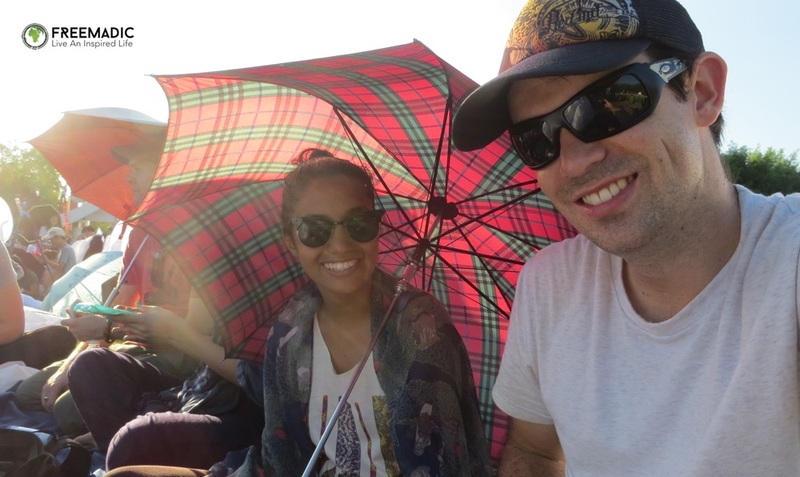 During our seven month adventure in Southeast Asia, we spent four months living in Chiang Mai – Thailand’s second largest city located in the mountainous north. Lacking the much loved tropical beaches, and famous tourist hot spots that Thailand is known for, we were often asked why we chose to spend so much time in this lesser known city. With plenty of research and discussion behind our decision, here are the nine reasons why we decided to spend four months in Chiang Mai – and why we’ll keep returning. Safety is always a huge concern for us while travelling as we’ve both been victims of theft, and travel with our valuable mobile office setup. Even though we take every precaution to make sure that our personal belongings are secure, staying in a safe city really puts our mind at ease. On various occasions we’ve put ourselves in situations where our valuables could have easily been stolen, and were pleasantly surprised when they weren’t. On one occasion I forgot my iPhone in a restaurant, and had the waitress come running after me to return it before we left on our scooter. On another occasion, Sean forgot his camera in the front compartment of our scooter while we went shopping, and find it exactly where he left it when we returned. It’s having the peace of mind, knowing that the people of the city can be trusted, and the way our valuables are respected that truly made us feel super safe in Chiang Mai. 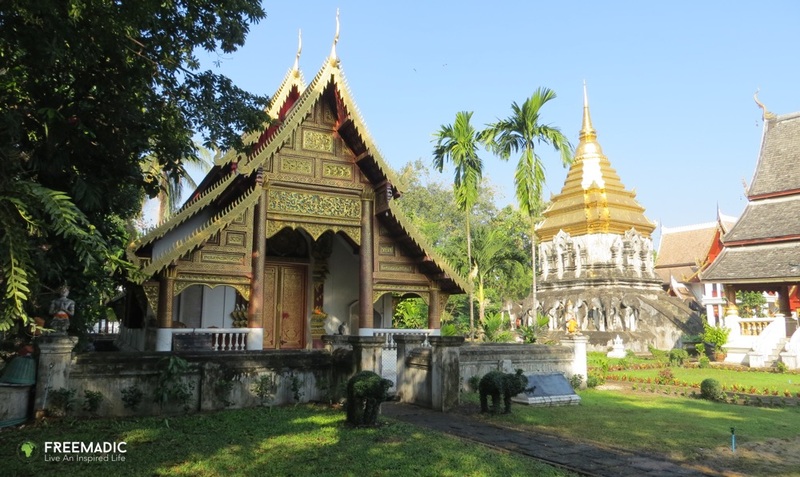 From the accommodation to the food, Chiang Mai is an extremely affordable destination. Our serviced apartment (one bedroom with kitchen and lounge), including unlimited Internet access, two flat screen TVs, a pool, a gym, weekly cleaning, and a 24-hour reception cost US$830 per month. Our scooter rental cost US$70 per month, with a tank of petrol (for the scooter) costing less than US$3! And a delicious vegan meal cost less than US$2. We lived extremely comfortably even enjoyed various private tours, regular visits to the cinema, and countless beers on the rooftop of Maya Lifestyle Centre. Coming from South Africa, our expectations of fast and affordable Internet compared to the rest of the world is pretty low. Being used to generally slow and expensive Internet connectivity we were impressed by the fast, efficient, and often free Internet access in Chiang Mai. Whether we were working at a co-working space, our apartment, or a cafe, the Internet was always effective enough to do our work productively. 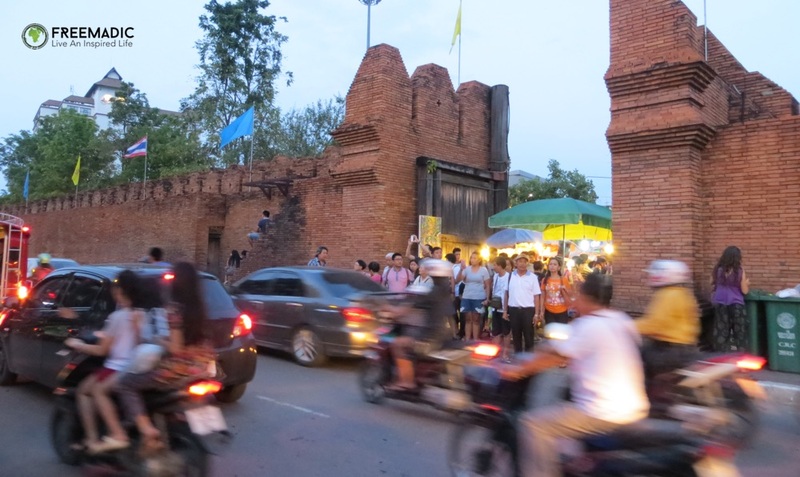 One of the main reasons we chose Chiang Mai to base ourselves was because we had done a lot of research into digital nomad hubs, and Chiang Mai often came out on top of review lists. 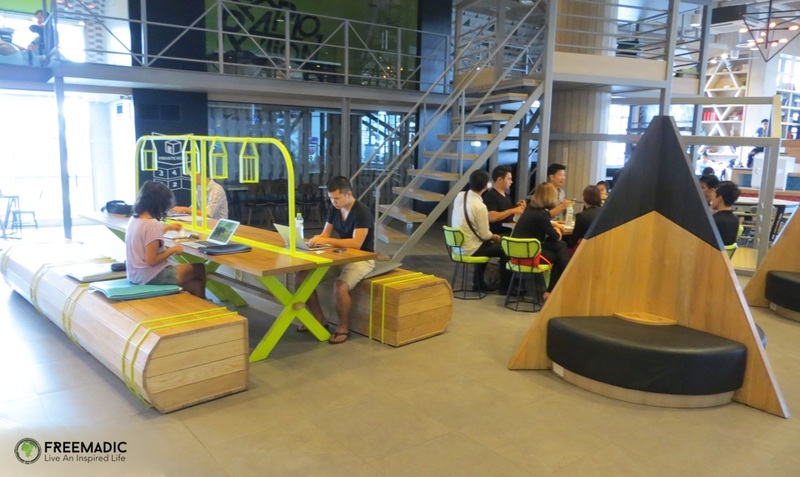 Regular meet ups and networking events, makes it is easy to meet other online freelancers, entrepreneurs and travellers. With its large expat and digital nomad community, Chiang Mai was a great place for us as first time location independent travellers. Many tourists (unfortunately) only make it as far as Bangkok or Phuket for a short holiday only seeing the tourist attractions and never really venturing out to see the real Thailand. In Chiang Mai locals outnumber tourists, which gave us plenty of opportunities to experience the diverse, more authentic Thai culture. 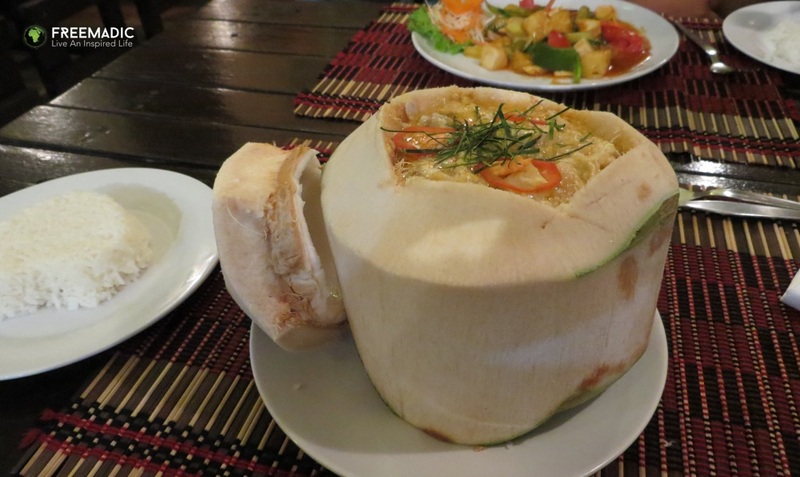 From watching monks collect their donated food as the sun comes up, to heading to restaurants where we were the only Westerners, we truly got an authentic Thai experience, and not the water down version that most tourists get. In Thailand scooters rule the roads! Scooters are affordable, convenient and the number one transport choice for most locals. Malls have designated scooter lanes and parking areas, cars on the roads will give scooters right of way, and parking is never a problem. We had a permanent scooter rental while in Chiang Mai, which gave us the freedom to explore to our heart’s content, which included trips to the Chiang Mai Quarry, Samoeng Loop, and Wat Phra That Doi Suthep. 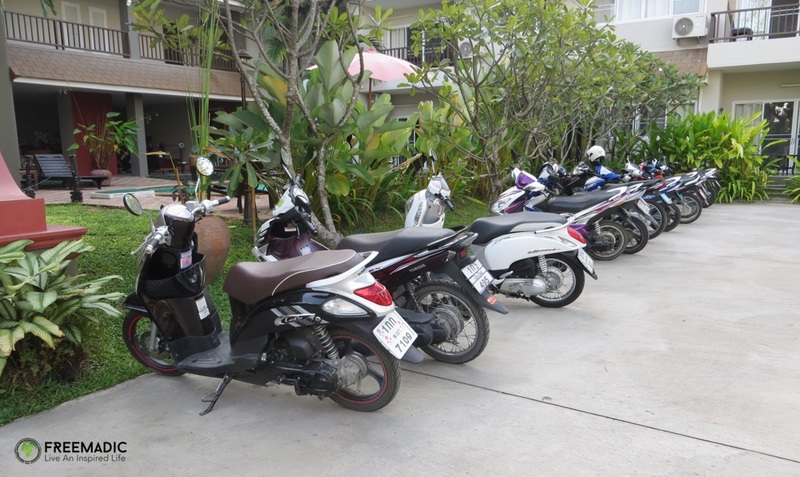 Before renting a scooter, read our post – The Risks of Renting & Riding Scooters in Thailand. 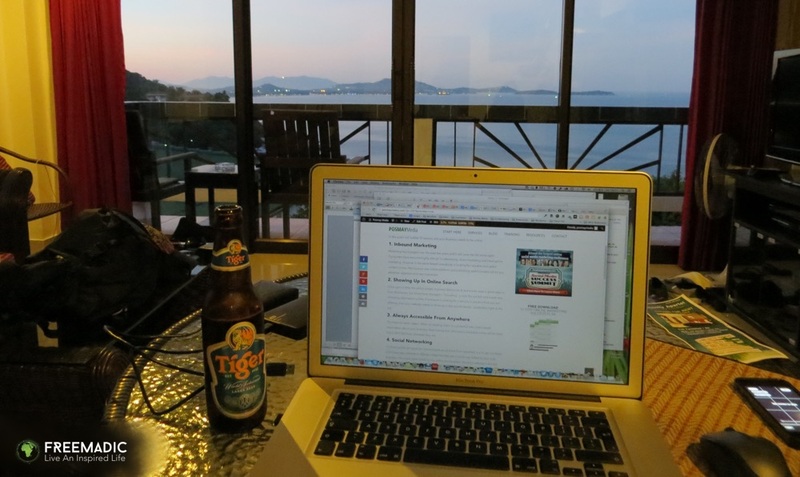 As self employed online professionals we prefer to avoid stress whenever possible, and Chiang Mai offers us an amazingly relaxed environment that kept our stress levels low and our productivity levels high. 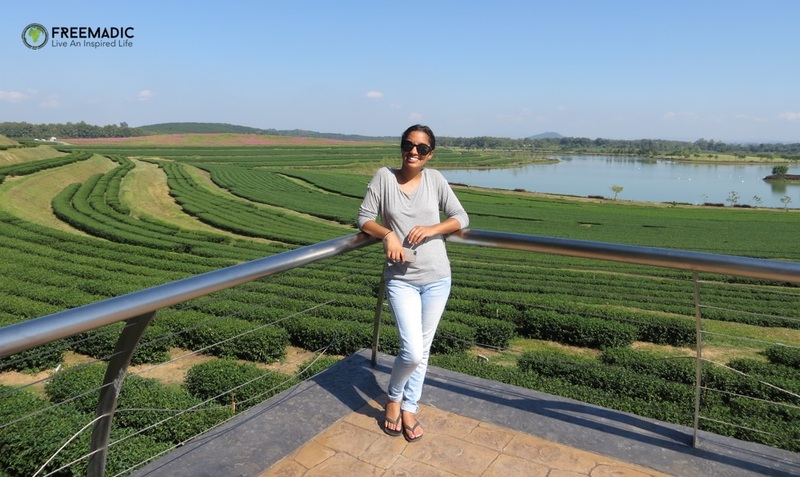 Being less touristy compared to Bangkok, Phuket and Koh Samui, Chiang Mai often felt like a small town with big city conveniences including an international airport, modern malls, co-working spaces, restaurants and great accommodation. We based ourselves in an area that was no more than a five minute drive from the Old City, numerous shopping malls, co-working spaces, and restaurants, making our lives easy. With a pharmacy, laundromat, 7 Eleven, scooter repair shop and a fresh produce market within walking distance of our apartment, we never needed to travel too far to get anything we needed. In most bigger cities you’d pay no less than US$1000 for a location surrounded by all these extra conveniences. This convenience at such a reasonable price made it an extremely relaxed environment, and comfortable living situation. As vegetarians we often find it difficult to find food that is meat-free, not carb based (pizza or pasta), and delicious. 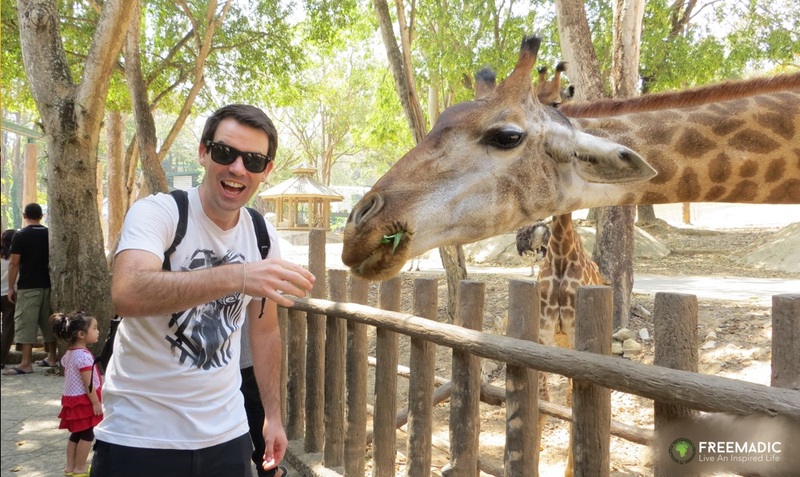 Unlike most cities, Chiang Mai is a huge advocate for vegetarianism, and we were blown away by the quality, taste and variety of vegetarian food and restaurants. From markets that offer a selection of cheap and tasty veggie options, to restaurants like Anchan, Free Bird Cafe, and Imm Aim, we had plenty to choose from. During our monthly long stay on Koh Samui we found that massage therapies were very popular amongst tourist. 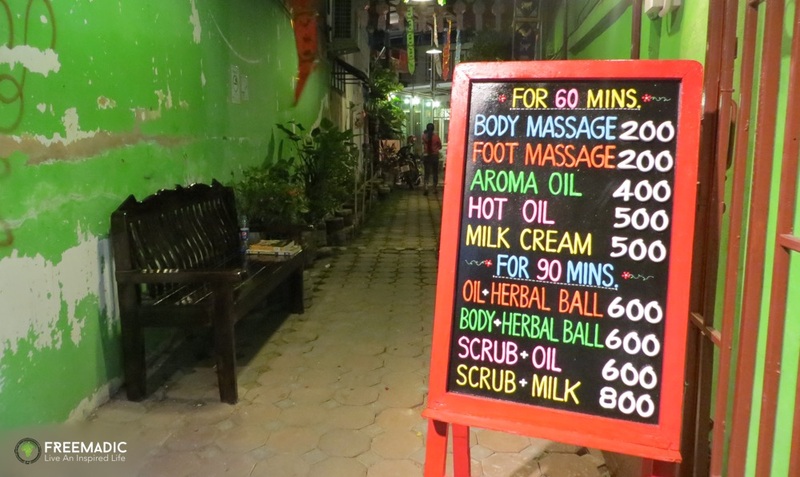 We enjoyed a few of them on the island, but found the best and most affordable massages in Chiang Mai. There is nothing better than going for regular massages to destress and relax. Lying on a massage table in a air conditioned bamboo shed, listening to traditional Thai music, with the smell of tiger balm in the air as you get the tension massaged out of your limbs is something we miss every single day. 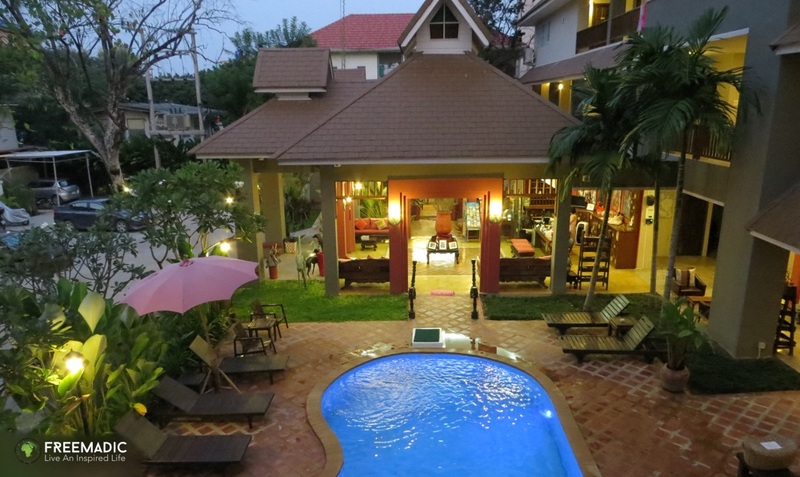 Let us know if you have any questions about visiting or living in Chiang Mai. We are happy to share more of our experiences and make recommendations. 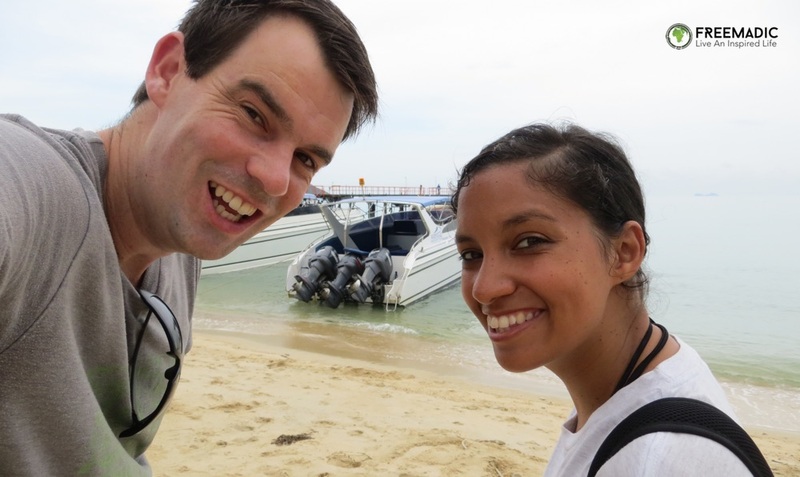 During our stay on Koh Samui, we took a day off to do a scooter round trip of the island to visit and enjoy the different areas. 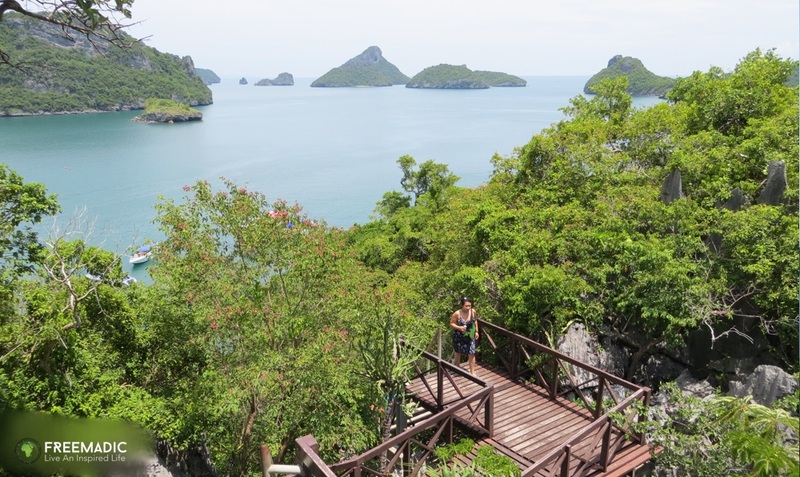 We swam at pristine beaches, ate at a local restaurant, and enjoyed the views at multiple look out spots. 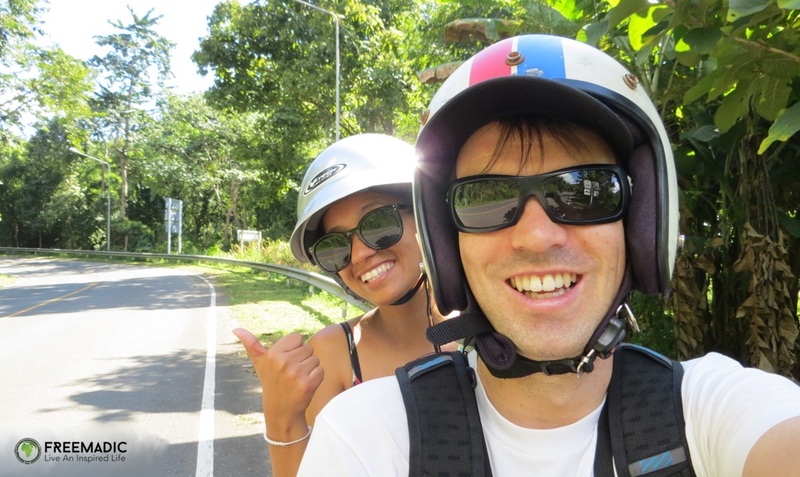 With over 15 years of experience (including driving in Thailand at the age of 16), and having a motorbike drivers license it was a no brainer for me to rent a scooter for the duration of our month long stay on Koh Samui. 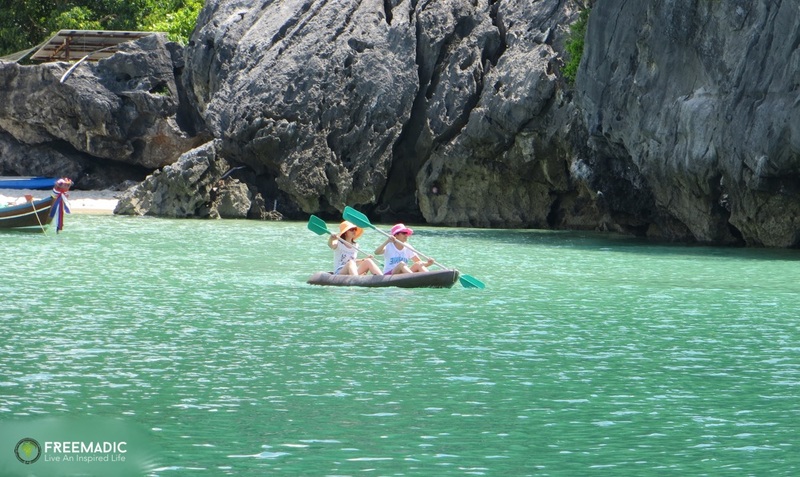 It was without a doubt the best way of getting around this beautiful island. Ever since visiting Thailand back in 2001, and exploring Phuket Island by scooter, I knew that I wanted to spend some time getting off the beaten track to explore the back roads, and find some hidden attractions. Riding a scooter in Thailand can be an affordable, convenient and fun way of getting around. As exhilarating as it may be, this mode of transport does however come with significant risks and may not be the best option for everyone. If you’re deciding whether or not to ride a scooter in Thailand, make sure to read my post “10 Things To Consider Before Renting a Scooter in Thailand”. 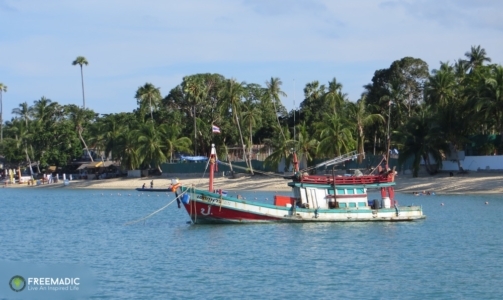 When visiting Koh Samui make sure to venture beyond Chaweng and Lamai. And if you’re not keen on renting a scooter and driving yourself, then join one of the many 4×4 tours on offer. 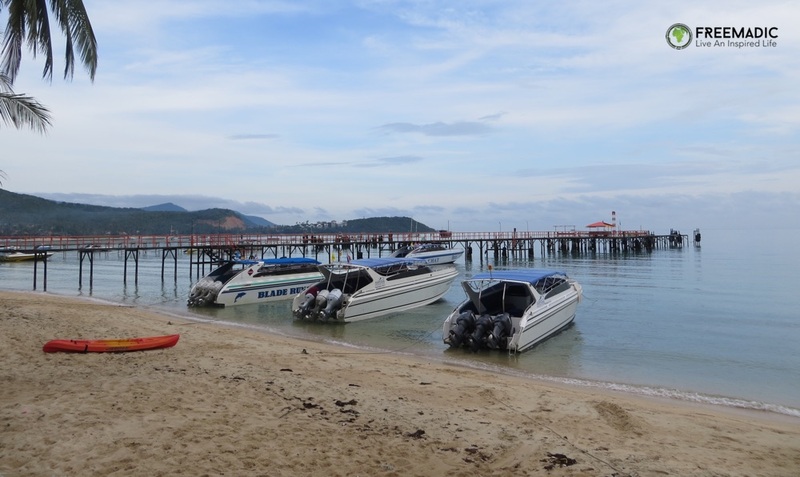 If you have any questions about visiting Koh Samui or renting a scooter in Thailand, please ask us on Twitter (@FreemadicLife) or on Facebook. Koh Samui is known to have some of the most beautiful beaches in Thailand, but to be perfectly honest, we often opted for the sandless, refreshing waters of our apartment’s infinity pools at Ban Sua Samui. Our apartment was not a beachside resort like most accommodation options on the island, so the pool with its incredible view was one of our favourite spots. 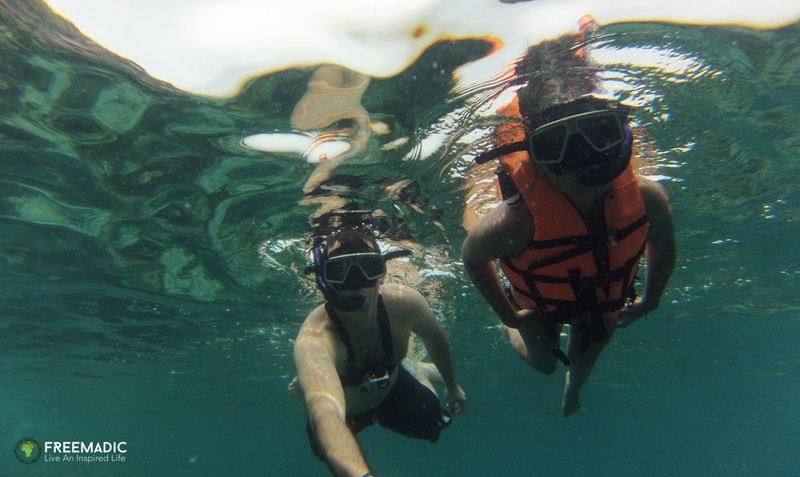 However, during our month long stay (while not scuba diving off Koh Tao or exploring Anthong National Park) we did spend some time on the beaches showing off our bikini bodies, taking morning walks, and enjoying the vibe that travellers from all around the world come to enjoy. 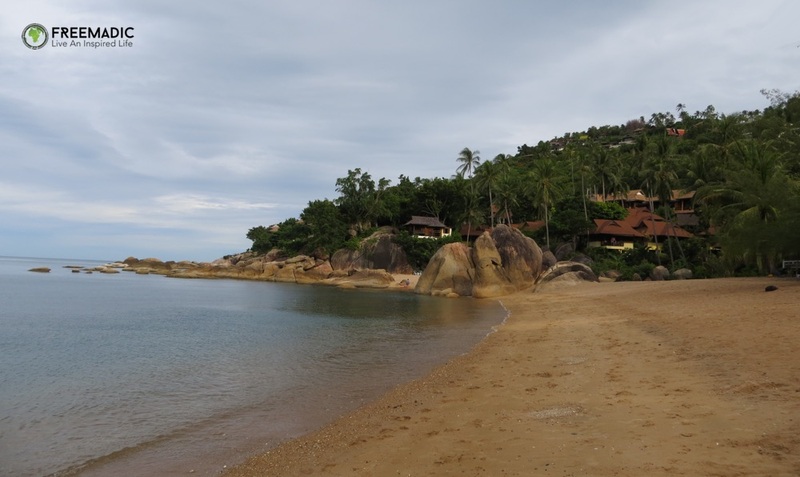 Here are four of the beaches on Koh Samui that we recommend exploring when you next visit this tropical island. 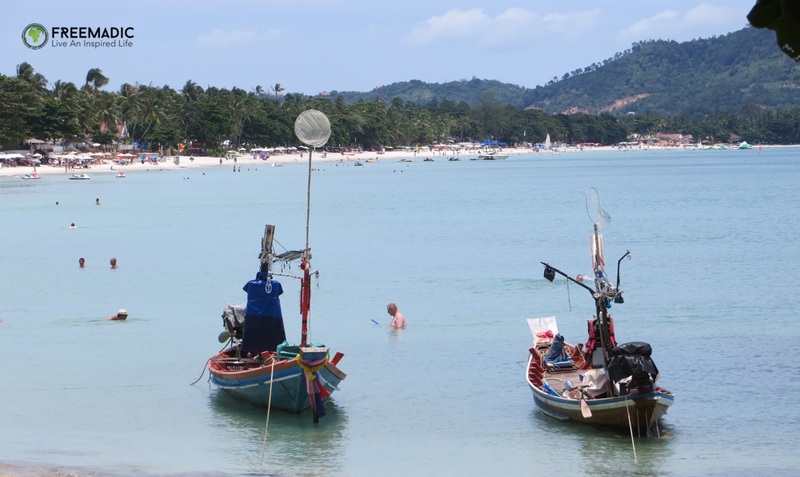 With most resorts lined up along the beachfront, Chaweng Beach is the most popular, busiest and longest beach on the island. Packed with plenty of activities including restaurants, parties, bars, jet skis for hire, massage stations, and paragliding, it is easy to spend the entire day soaking up the sun on this beach. 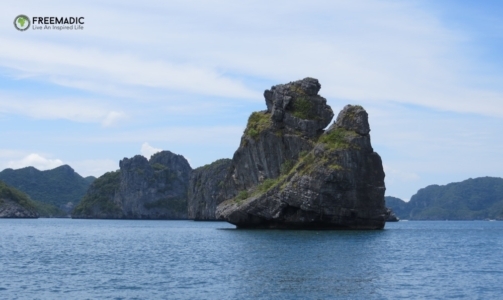 Because of its popularity, it is also home to many scammers trying to make a quick buck off unsuspecting tourists. 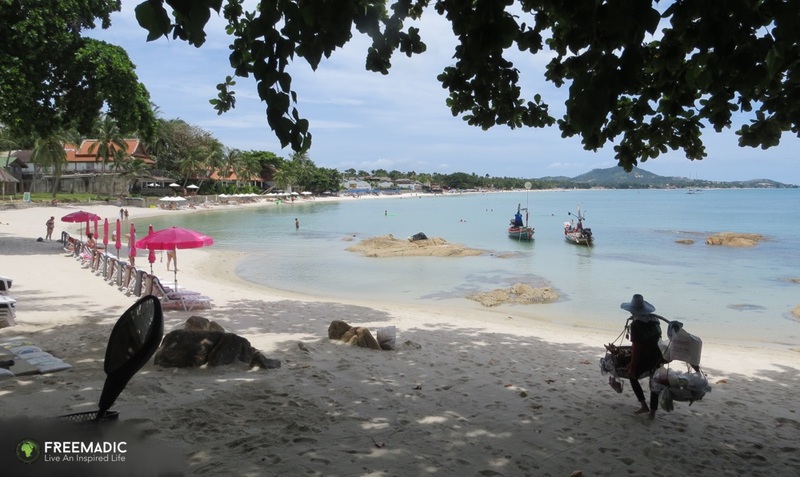 Why We Loved It: We avoided Chaweng during the day and at night, but enjoyed a few early morning walks and swims before the crowds came out. 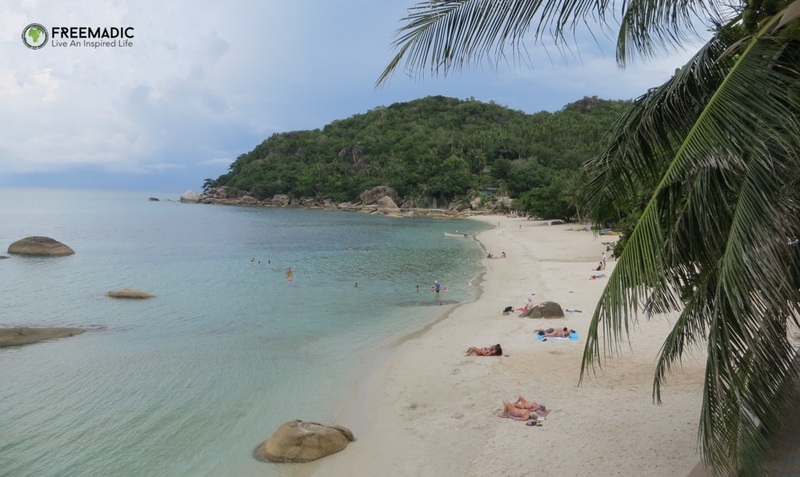 About a 10 minute drive from Chaweng Beach, you’ll find Lamai – the second largest beach on the island. Even though less busy, you’ll find that this beach also has plenty of restaurants, cocktail bars, water activities to choose from. 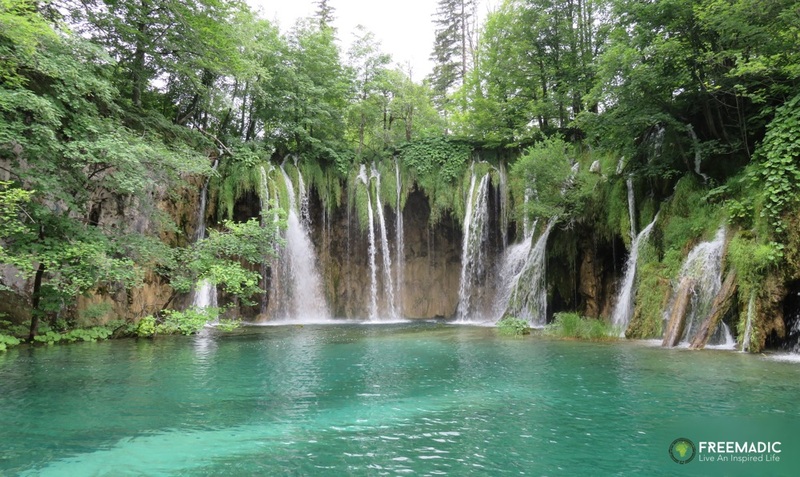 It is also the perfect place to go for a swim on a hot day. 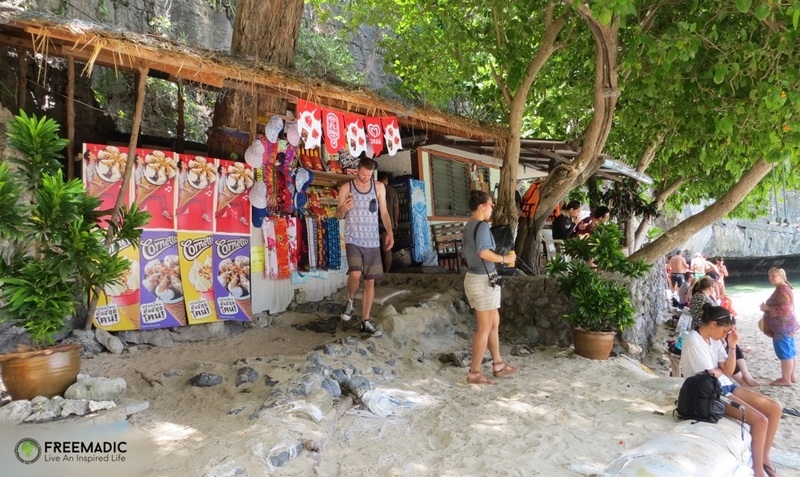 Why We Loved It: Every Sunday we headed to Lamai where we could enjoy a swim followed by a stroll through the weekly market. 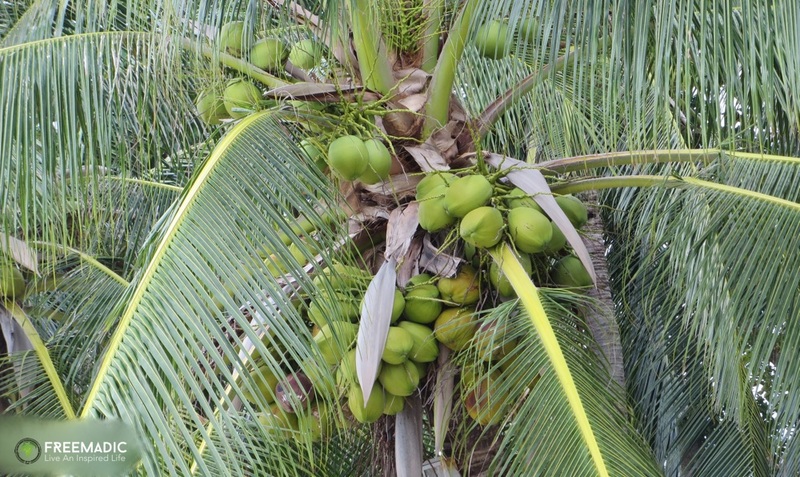 The food, atmosphere, and shopping is something that everyone on the island should experience. 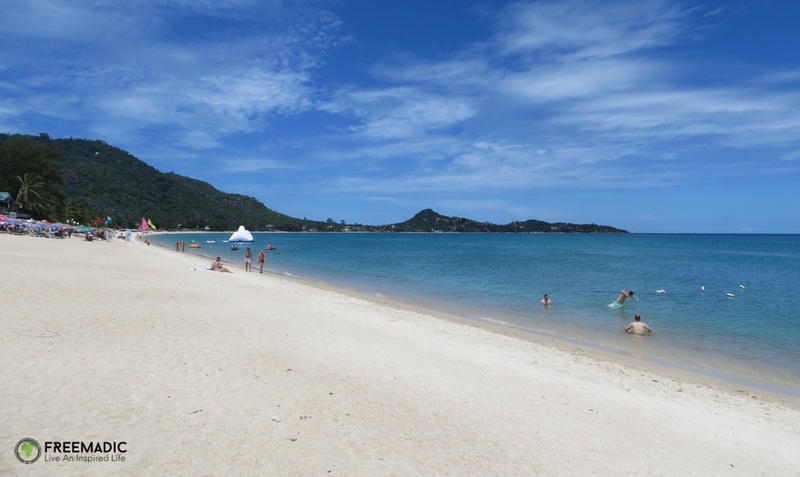 Arguably the most beautiful beach on the island, Silver Beach is located between the bigger beaches of Chaweng and Lamai, hidden behind a row of resorts. We unfortunately only discovered this beach towards the end of our stay, and wished we had more time to spend on its sandy shores. 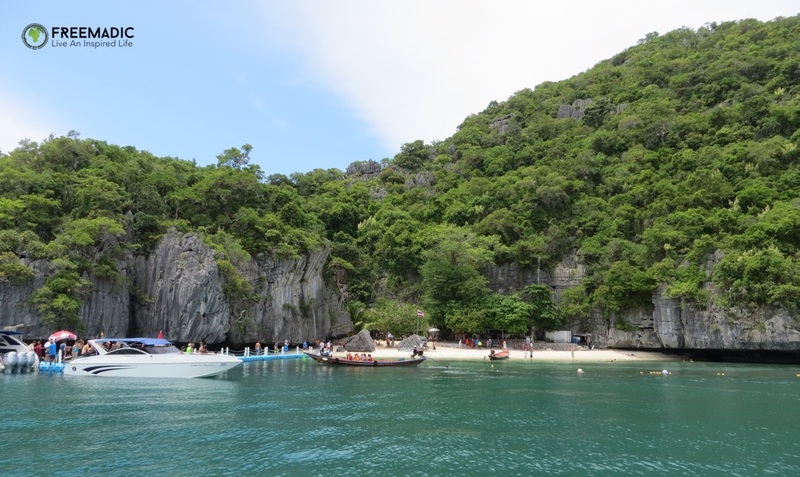 With no public access, you’ll need to walk through one of the resorts, and down a flight of stairs before getting to this beach. 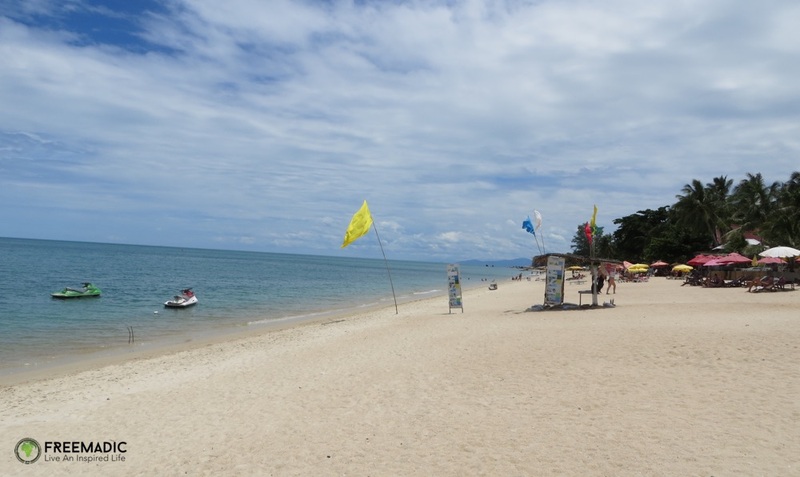 Why We Loved It: Unlike other beaches on Koh Samui this beach was picturesque and tranquil – without the jetskis, bars, and all the other attractions that the bigger beaches have to offer. 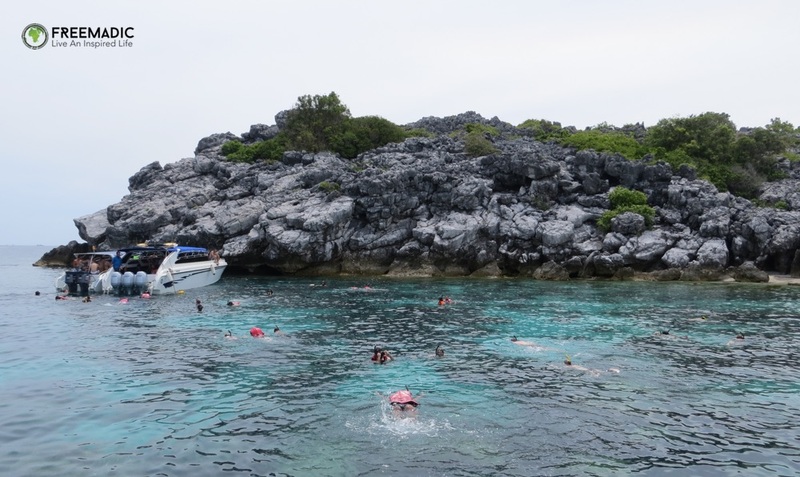 In a small cove between Chaweng and Silver Beach is Coral Cove. With calm waters, kayaks for hire, and a single restaurant, this beach is perfect for a family day or a romantic dinner. It is also the beach where we spent most of our time because it was the closest to our apartment. 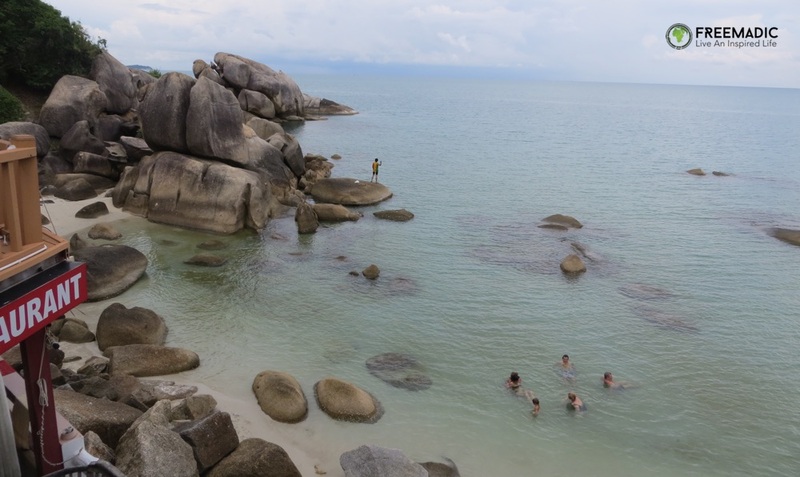 Why We Love It: Being one of the smaller, hidden beaches, away from Chaweng and Lamai, this beach was never crowded and offers some great spots for swimming and kayaking. After six years of working in various 9-5 jobs, and always having a boss, I decided to take my freelance writing career into my own hands, and became self employed. For me, self employment came with a lot of fear, self doubt, and anxiety – not to mention the family concern of me not being able to support myself. Even though I was unhappy in my 9-5, and spent six months questioning quitting, my crossroads came when the magazine I was working for closed down, and I was offered a position within the bigger company that I didn’t want. It was an abrupt moment of clarity that allowed me to see that the security, stability, and monthly income that I was promised, was not permanent. So for the first time I ignored what society was telling me to do, followed my gut, and did what was best for me. I remember my first day at home after quitting, and the fear I had of not being able to succeed as a freelancer. Most people around me kept telling me to find another 9-5, and everything would be okay. Yes, 9-5 would give me a paycheque, but not happiness and fulfillment. I was never happy building someone else’s dream at the expense of not following my own. I didn’t want to be stuck in a system where employment is given to me just as fast as it can be taken away. I needed to stop and listen to my gut before listening to anyone else’s advice. And my gut was screaming at me saying, “If you don’t like doing something, why do you keep on doing it?” So I stopped applying for 9-5 jobs, focused on applying and improving my existing skills, and started offering my services as a freelance writer and editor. If you want to quit your job, freelance, start a business, and live your best life, then stop dreaming about it, and start taking action. Yes it does come with risks that you can constantly convert into excuses, but honestly what’s the worst that can happen? For six months before leaving my job, I came up with every excuse in the book – I wanted to save more money, wait till my car had been paid off, and wanted to find freelance clients while working a 9-5 job (which my job did not allow). I made all these excuses because I was scared to step out of my comfort zone, afraid of the unknown, and being a failure. As soon as I stopped making excuses and started doing the things that scared me, my mindset shifted. Instead of being afraid of failure, I started seeing challenges, and opportunities to succeed. During the first year of my freelance writing career I saw every client I didn’t get, and every project I lost as a major failure! I felt like all my hard work resulted in nothing, and that society was right by saying I needed to get a 9-5 job. After losing my only client at the time because he found someone cheaper, I realised that it wasn’t personal. The client didn’t let me go because he didn’t approve of my work, but because of his own budget, and my need for a liveable income. I soon started seeing “failures” as stepping stones, each with their own unique lesson. Lessons are there to be learnt from, and if we only see the failure in everything, we’ll never learn. Today, two and a half years later, I’ve realised that making the shift from formal employment to freelancing has empowered me, and it has let me take charge of my own life and happiness. It has been a process that has included a lot of realisation, an attitude adjustment, and ongoing work on myself and my business. You only have one life and it’s up to you to make it the best life. If you’re not happy where you are, then move – you are not a tree! 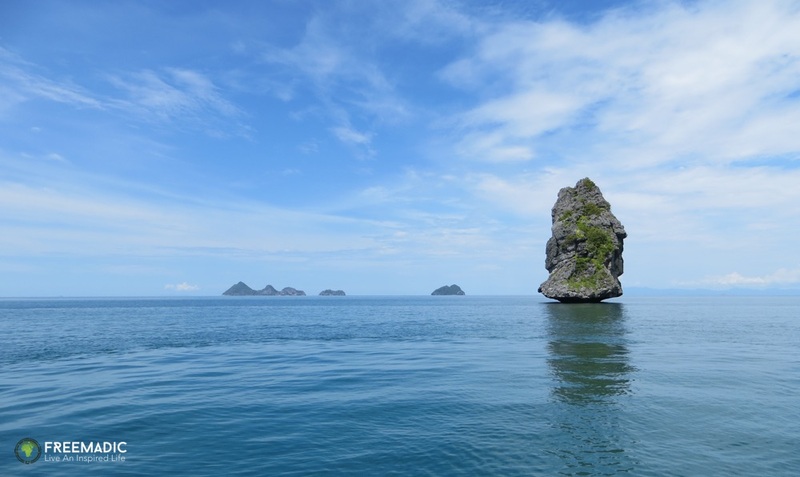 Taking a break from work, and wanting to explore some more of Thailand’s aquatic beauty, we headed to Anthong National Marine Park. 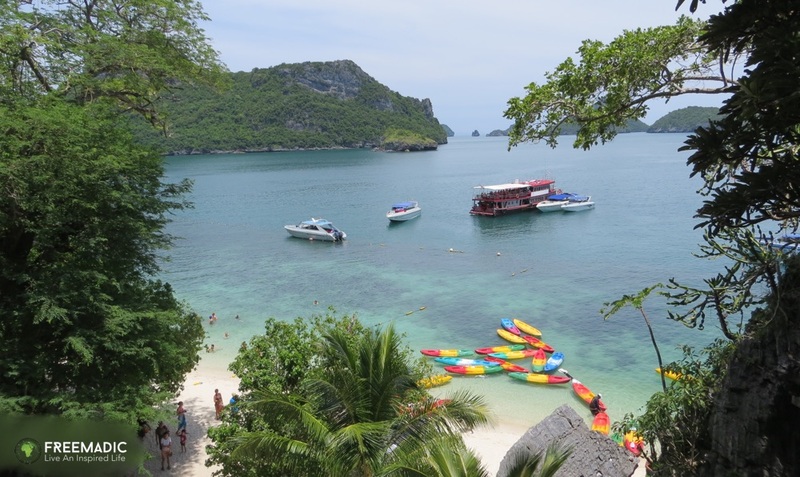 Promised a day of snorkelling, island-hopping, beautiful views, a delicious lunch, and kayaking, we were excited to head to this incredible area off the shores of Surat Thani Province. Located in The Gulf of Thailand, the 102 square metre area boasts 41 undeveloped islands, as well as Koh Paluay which has been inhabited by sea-gypsies. The protected park can easily be accessed via Koh Samui and Koh Phangan with various tour companies. Please be sure to enquire if your tour includes the entrance fee to the park. 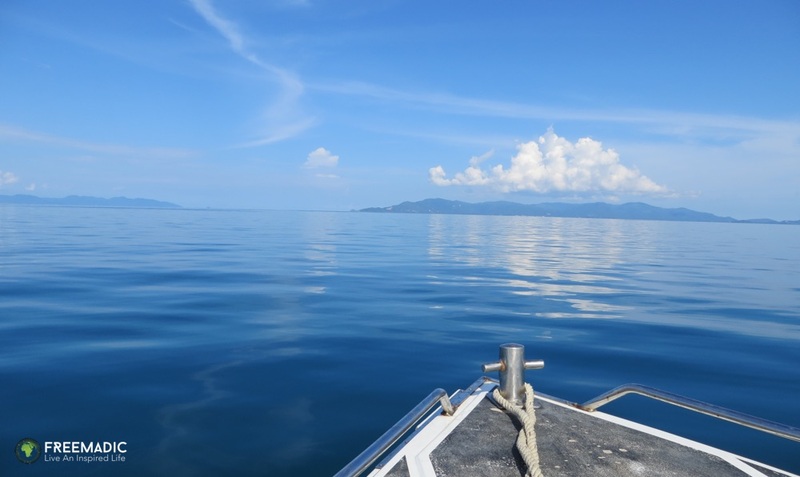 From snorkelling around Koh Woa, heading to a viewpoint of surrounding islands and the Emerald Lake on Talay Nai, as well as having a traditional Thai lunch on Koh Paluay, this national park has so much to offer its visitors. If you have any questions about visiting Koh Samui or visiting Anthong National Marine Park, please ask us on Twitter (@FreemadicLife) or on Facebook. Back in 2008, after finishing my business science and marketing degree, and spending a year working and travelling in Australia, it was time for me to launch and build my career. I started working at an online agency which I enjoyed, but after having a taste of formal employment and the 9-5 routine, I quickly decided that it wasn’t for me. After just two weeks, I quit, and started pursuing my own path. Not settling for a traditional 9-5 job, and deciding to become my own boss was one of the toughest yet best decisions I’ve ever made. I went on to start Posmay Media – a digital media agency that specialises in web development and online marketing services – which I still run today. Eight years later and I’ve done a lot, launched a lot, failed a lot, but most importantly learnt a lot. I’ve also enjoyed the multiple benefits of being self employed, and in this post I share the five major benefits of being or becoming self sufficient in your career. Having the freedom to not only live on the weekends is something most people only dream about. Being able to create your own schedule and work routine let’s you design and live your ideal lifestyle. You get to decide when you’d like to work and how much you’d like to work. For me owning my own time means that I have complete freedom, but I also have the responsibility to be disciplined and make the right decisions. I get to allocate my time based on my personal priorities which include focusing on growing my business, helping my clients, spending time with family and friends, travelling the world, educating myself further and pursuing my hobbies. When the waves are great, then I can go surfing or skimboarding, when I feel burnt out or exhausted, I can take a break, and when a family member or friend visits the town I’m in, then I can take time off to spend with them. Having this flexibility increases my quality of life and opens up a world of opportunities. Being self employed let’s you focus on your strengths, and on doing your best work. Combine what you love, what you’re good at, and what people are willing to pay you for and you’ve got a winning formula. Initially it’s all about generating the income you need to pay your bills, but once that’s done you can explore further. You can try something new or improve your skills in something you’re already good at. For me it all started with writing, recording, and performing music throughout high school and university. 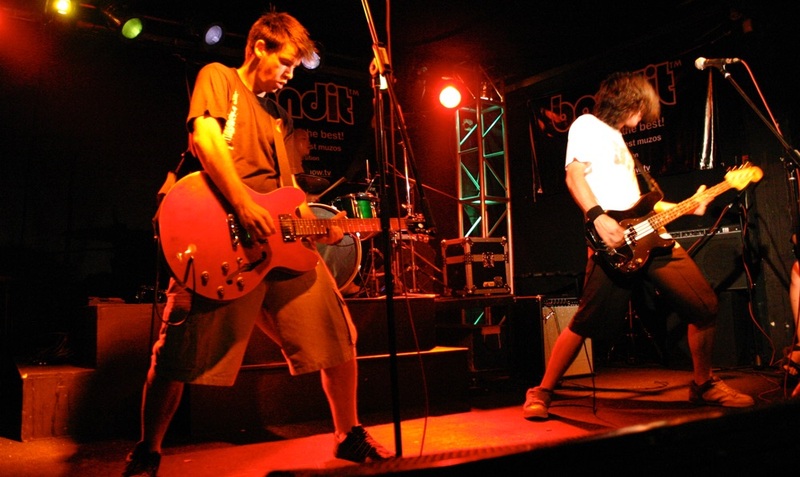 The band that I had created was a real life project that let me test, explore and learn. I learnt as much as I could about the music industry, music distribution, digital recording, the Internet, online publishing, and online marketing. I also launched various passion projects on the side that let me test new ideas and acquire new skills. I enjoy working at the intersection where creativity meets business – where the suit meets the artist – as I am essentially both. Learning by doing has let me explore my own creativity while acquiring valuable skills that I use on a daily basis to help and empower my clients. Being employed by a company that you admire is great, however having the freedom and taking the risk to create something that you own and believe in takes it one step further. If you don’t focus on building your own dream, then someone else will hire you to build theirs. Over the last eight years I’ve explored various areas of online business and online marketing. Positive Mayhem was the brand I created to self publish my bands’ album ‘On The Rise’. Positive Mayhem quickly evolved and became Posmay Media which today is my primary business. I’ve also developed SkimZA, which is a website dedicated to promoting skimboarding in South Africa, as well as an online store that sells imported skimboarding gear in South Africa. One of my latest projects is Freemadic which is an online resource to document our personal journey and help others find explore beyond their boundaries, find true freedom and live an inspired life on their own terms. Owning your own time also gives you the opportunity to spend time on self development and learning more about topics that interest you. In my spare time I consume strategic content and attend events to expand my knowledge and understanding of topics that interest me, and that can help me reach my next goal. Content that I learn from includes blog posts, eBooks, webinars, YouTube videos, online courses, as well as conference keynotes and mastermind groups. I’m constantly learning and growing – acquiring the skills and knowledge that I need to help myself and my clients enhance their online marketing efforts to succeed online. In most cases when working for someone else you’ll be paid a monthly salary with employment benefits. Based on the performance of the company, your salary will increase every year, and if you’re lucky you might get a bonus. Some specific positions may also offer performance based incentives – for example getting additional bonuses for reaching sales targets. Being self employed, your income depends entirely on you and your company – based on how much you work and what you are selling. Work hard and smart and you will be rewarded, and without a monthly safety net comes limitless income opportunity. 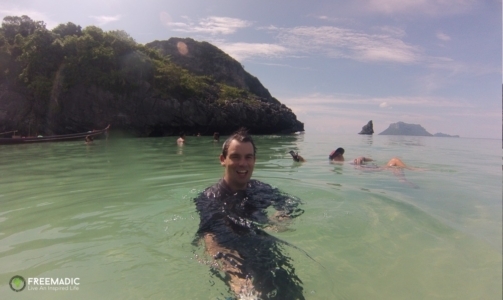 In 2014/15 I spent a lot of time travelling and exploring new countries in Southeast Asia. This was a very exciting time, but it was also a very disruptive time. I struggled to focus on my primary business, which led to a drop in my income. I’ve since learnt a lot about finding an effective balance of working and travelling, and have restored my income to where it used to be and am working on increasing it even more. At first thought the opportunity of working from anywhere might only be available to those that work online, however this is not the case. No matter what your business is there is always an option to scale and expand. You can build a team, bring in additional management to free up your own time. By creating processes and delegating effectively you can set up your business to operate without you being present, which gives you more freedom and the opportunity to work from anywhere. Being able to work independently online has given me the opportunity to work from anywhere – as long as I have my mobile office and a reliable Internet connection. This has enabled me to live my dream of travelling the world, while still building a business and generating income. In 2011 I spent 5 months in the US, meeting and skimboarding with some of the best riders in California. This past year (2014/15) I spent 9 months travelling exploring Thailand, Vietnam, Turkey, Croatia and Germany. Self employed and living the digital nomad lifestyle is definitely not for everybody, but if you have an itching desire to realise a bigger dream, then I encourage you to start your journey today. If you have any questions please share them with us on Twitter (@FreemadicLife) or on our Facebook page. 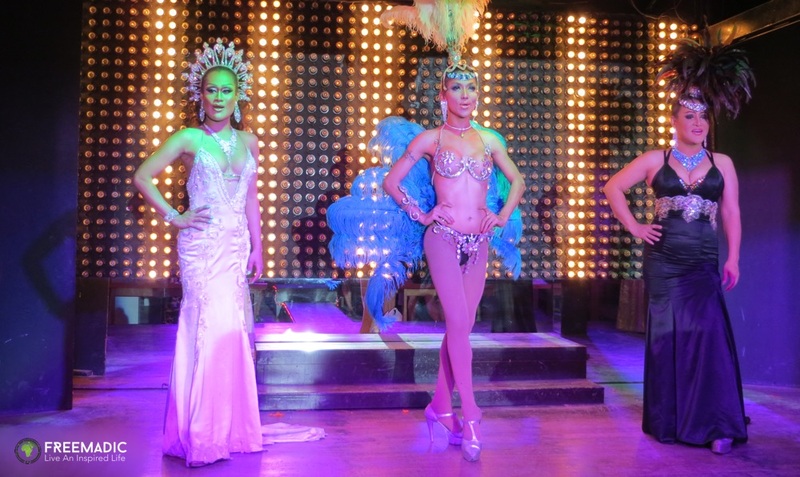 Besides relaxing at beachside resorts, scuba diving with tropical fish, visiting temples, and exploring the jungle, another item on our Thai bucket list was going to a ladyboy cabaret. 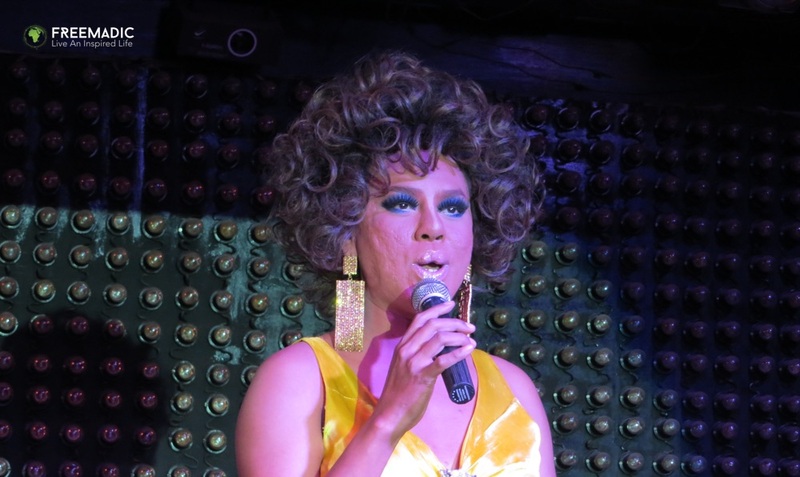 Dressed in flamboyant outfits, lip-syncing to popular songs, and dancing the night away, these transgender women or an effeminate gay male are one of the highlights of most tourist trips. Putting on spectacular shows on a minimal budget with no professional training, these ladyboys are truly impressive. 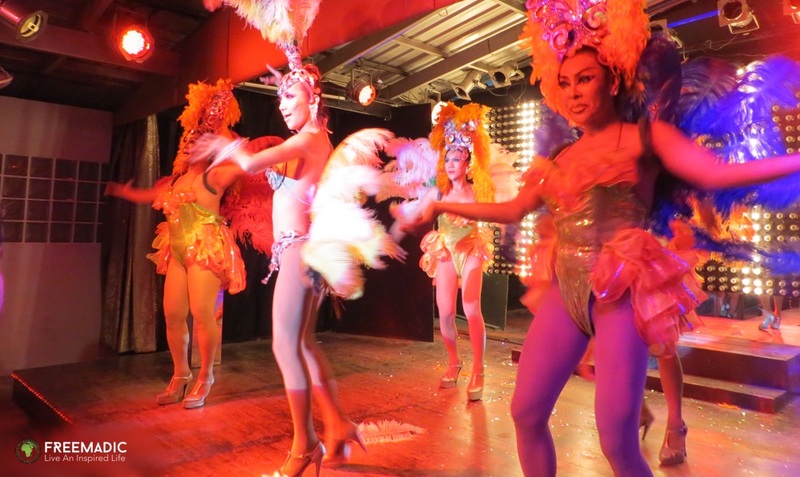 Having never been to a ladyboy show before, we decided to head to Starz Cabaret on Koh Samui. With free entry (you will have to buy a drink which costs about 200 Baht each), we settled into our seats and waited for the show to begin. Taken aback at first with these women’s sheer beauty, we soon relaxed and got into the show. The professionalism (and sometimes lack thereof) made an entertaining evening of loads of laughter, uncomfortable situations, and often questioning if she was once a he. But being a ladyboy is more than just dress up and being a cabaret performer, it is someones choice. Known as Kathoey – which directly translates to ‘lady boy’ – by locals, these woman are fully accepted into Thai society, celebrated for who they are, and even perceived as a third gender – which is incredible considering how taboo the subject of transgenderism is in most parts of the world. From waitresses, and factory workers, to hotel receptionists and chefs in popular restaurants, it often amazed us at how Thai people did not discriminate, but rather celebrated the diversity of everyone in their country. 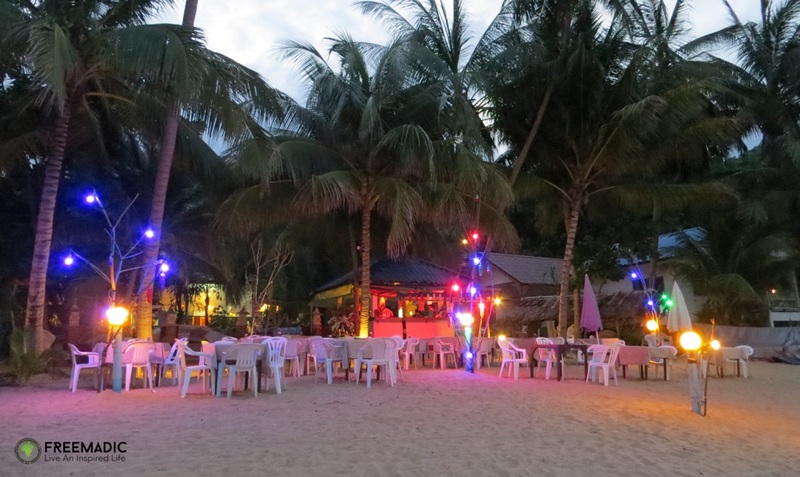 Starz Carbert is located on Chaweng Beach Road on Koh Samui and runs two nightly shows that start at 20:30 and 22:00. If you have any questions about visiting Koh Samui or going to Starz Caberet, please ask us on Twitter (@FreemadicLife) or on Facebook.